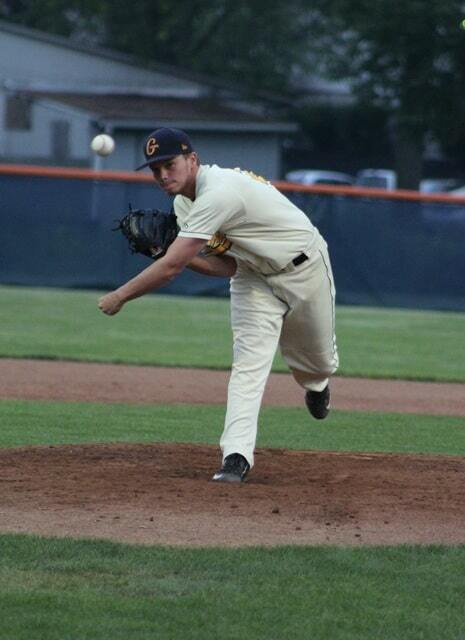 GALION — A season of frustration continued over the Independence Day weekend for the Galion Graders, which split a series with the Southern Ohio Copperheads. The Graders (6-14) earned a 4-3 win over the Copperheads on Saturday at Bob Wren Stadium in Athens, but Southern Ohio returned the favor with a 6-5 victory against Galion on Sunday evening in front of a huge crowd at Heise Park’s James D. Heddleson Field. Graders general manager Mike O’Leary said the official attendance on Sunday was 1,022, far and away the largest home crowd for Galion in its inaugural season in the Great Lakes Summer Collegiate League. However, for Galion head coach Ray Neill, it was yet another disappointing outing for his struggling ballclub. Frustration set in early for the Graders on Sunday. With two outs in the top of the first inning, Southern Ohio’s Trevor Ezell belted a solo home run to right field off of Galion starter Nick Muse to give the Copperheads a 1-0 lead. Charlie Watters then led off the top of the second inning with a solo shot to nearly the same spot in right field to push the lead to 2-0. Southern Ohio starter Roscoe Blackburn held the Graders at bay until the fifth inning when Galion pulled back a run to cut the deficit to 2-1. Kevin Shrock led off with a walk then advanced to third on a ground out by Mark Walton and a basehit by Tyler Ocker. Colton Carney drove in Shrock with a fielder’s choice. Galion ended up leaving two men on base, though. The Mr. Hyde side of the Graders reared his ugly head in the seventh inning as Southern Ohio exploded for four runs to extend its lead to 6-1. Galion reliever Kody Brown walked three of the five batters he faced in the seventh. Ezell reached base on an error that allowed a run to score and then Ryan Rippee slapped a two-run single through the left side of the infield to give Southern Ohio a 5-1 cushion. Connor Gallery drove in Ezell with a sacrifice fly to center field to round out the big inning for the Copperheads. Galion closed the gap to 6-2 in the bottom of the seventh when Nick Riotto scored on a ground out by Mark Delas. But the Graders again left two runners on base at the end of the inning. The eighth inning started in promising fashion for Galion after Hunter Clanin drove a double into the gap in left center field. Riotto laced a two-out single to center to drive in Clanin and cut the deficit to 6-3, but the Graders were unable to generate any further offense. Galion continued its rally in the ninth with J.T. Core leading off with a single and Zack DeThomasis driving a double to center to give the Graders runners at second and third. Core scored on a passed ball and DeThomasis scored on an error that allowed Delas to reach base. Aaron Caputo followed with a basehit that gave Galion two runners on base with no outs. However, Mr. Hyde again appeared for Galion in the form of a pop-up to right field by Clanin and a 4-6-3 double play hit into by Austin Adams to end the game. Rippee and David Dobrinich each had two hits for the Copperheads (14-9), which won the season series with the Graders, 3-1. Blackburn (1-1) earned the win after holding Galion to one run on two hits in six innings. He struck out three batters and walked four. Eddie Fitzpatrick picked up his fifth save of the season despite giving up two runs on three hits in the ninth. DeThomasis had two hits to lead the Graders. Riotto, Core, Clanin, Caputo, Ocker and Brandon Wright each had a hit. The Graders left 10 men on base and committed four errors. Muse (0-1) took the loss. He pitched 4-2/3 innings and gave up two runs on six hits, including the two home runs. He recorded four strikeouts. Galion plays host to the Cincinnati Steam on Tuesday at Heise Park. First pitch is 7:05 p.m. The Graders play a doubleheader against the Lorain County Ironmen on Thursday at Heise Park. The first game starts at 4:05 p.m. Game two will begin at 7:05 p.m.
Galion’s next home game is Sunday against the Grand Lake Mariners. First pitch is 7:05 p.m.